As we head into Remembrance Day this year, the weight of honouring our fallen is already heavy on our hearts. It’s been an emotional couple of weeks with the deaths of Nathan Cirillo and Patrice Vincent, Canadian soldiers both killed on our own soil. Remembrance Day is the tragic epilogue that so many of our citizens have made that ultimate sacrifice before them. We vow to remember those sacrifices, and the most heartening reminder of that for me recently is our Highway of Heroes. 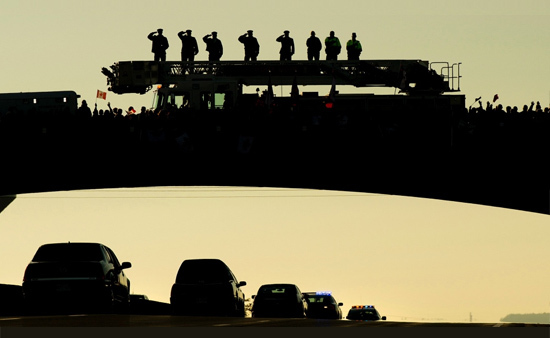 As I drove home from work on the evening that Corporal Cirillo’s cortège was to making its way back to his hometown, I was filled with enormous gratitude for living amongst the people that I do. Hundreds were standing along the overpasses, hanging flags on the side road, and even pulled over on the side of the highway. No organized ceremony, this was a movement made up of hundreds of individual decisions that a gesture needed to be made, and going out to be present for that cortège was the right thing to do. The money raised online for the Cirillo and Vincent families was another amazing collective gesture. The initial goal of the Stand On Guard Fund was $10,000 and funds now exceed $700,000. We are all so different and yet thousands of people decided, each for themselves, that this too was the right thing to do. So as we stop to remember all the soldiers that have lost their lives for our country, I’d like to highlight a similar initiative that has been doing great work to support our Canadian Forces since 2009. The True Patriot Love Foundation is a national charity that works to fund programs and research which help soldiers, veterans and their families, as well and raise awareness for the issues that they face today. The need is great, unfortunately, but our capacity to honour them is too.